Here's how I did this. I cut some mixed media paper to 4 1/4 x 5 1/2. Watercolor paper works well, too. You just need something heavy duty that won't warp with all the different mediums on them. To help the paint and ink slide over the surface, I add a fine layer of gesso. Gesso dries quickly, but I like to help it along with my heat tool. After the gesso was dry, I brushed on Martha Stewart Aquarium Pearl Craft Paint on it. I love the creamy texture of this paint and the sheen when it dries. I rubbed an ink pad of Ranger Evergreen bough over my card base to tone down the paint. I love this color when I do that. At this point my mad scientist self showed up to the crafting party. I mixed Ranger Texture Paste, Faber-Castell Glass Bead Gel, and Jillibean Silver Glitter together. I had never done this before, but when it dried, I felt like a genius. 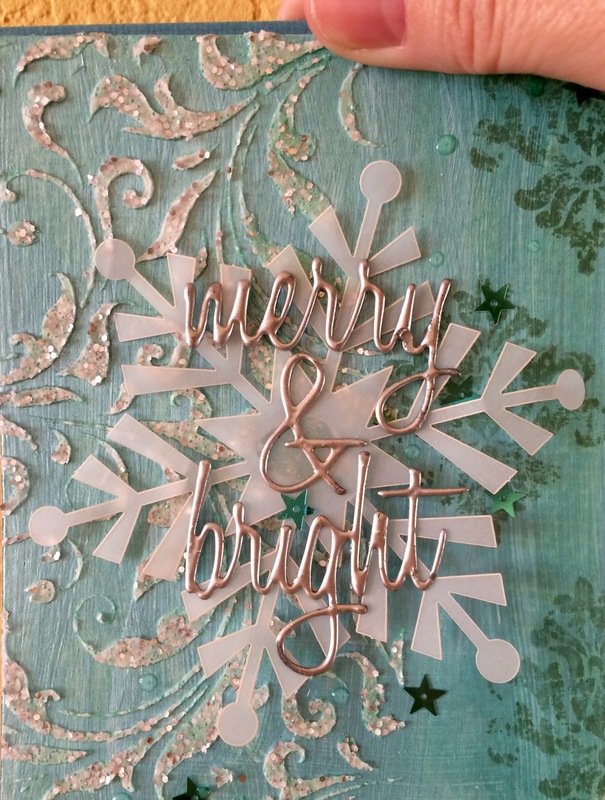 It was opaque to clear with glitter and shiny glass beads giving my card a frosty look. I used some green ink I had on hand to stamp with Tim Holtz' Distress Damask Stamp. I looked through my old cigar box of odds and ends and found this awesome vellum snowflake. I was just thinking of cutting out a vellum snowflake with my Cricut when I found it. I stuck it to the middle of my card with a glue dot. This card sat on my craft table for most of the week while I finalized a field trip at school, helped my student teacher through her observation, and wrapped up conferences. This morning while lounging with my coffee, I figured out how to finish this card. I cut out the words Merry & Bright from my Tim Holz (yes, I'm a fan girl) Season's Greetings dies. I embossed them three times dipping them in my Versa Mark ink pad and then my container of Ranger Silver Embossing Powder. Doing this makes your die cuts look like they are made of metal--a very cool effect. I added some blue start sequins and some Nuovo Crystal drops for just right finishing details. My card was done and I was still in my pjs! What a great morning! Materials are affiliate links from Amazon where I buy most of my crafting supplies.